Stem cells are undifferentiated biological cells that can differentiate into specialized cells and can divide (through mitosis) to produce more stem cells. They are found in multicellular organisms. In mammals, there are two broad types of stem cells: embryonic stem cells, which are isolated from the inner cell mass of blastocysts, and adult stem cells, which are found in various tissues. In adult organisms, stem cells and progenitor cells act as a repair system for the body, replenishing adult tissues. 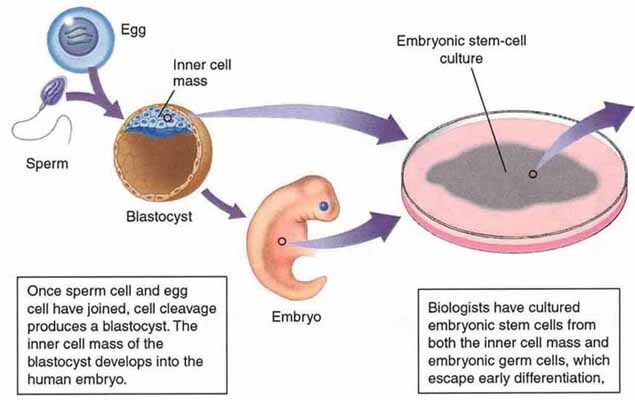 In a developing embryo, stem cells can differentiate into all the specialized cells - ectoderm, endoderm and mesoderm - but also maintain the normal turnover of regenerative organs, such as blood, skin, or intestinal tissues. Stem cells can also be taken from umbilical cord blood just after birth. Of all stem cell types, autologous harvesting involves the least risk. By definition, autologous cells are obtained from one's own body, just as one may bank his or her own blood for elective surgical procedures. A unique source of stem cells in blood helps to build blood vessels in the growing embryo. This finding changes scientific understanding of how blood vessels are made and brings scientists one step closer to using stem cells to grow new blood vessels and repair damaged ones. John Bracht, American University biology assistant professor, and his students discovered a new type of cell state that could help ensure one always has the ability to generate healthy fat cells. The finding falls in line with increasing scientific discoveries elucidating how complex our cells are and how much we have yet to learn about their makeup. The discovery involves stem cells. Stem cells are usually thought of as replicating cells. Other cells perform specific functions. To turn into a specialized cell, a stem cell must be given instructions. As the team grew stem cells in the petri dish, they noticed some stem cells not following orders. They were curious. If the stem cells wouldn't turn into fat cells, then what did they become? Eventually, the team found that the rogue cells could differentiate and become fat cells. From previous work, the researchers knew that stem cells are likely reading out instructions from neighboring tissues to guide their path, and it became clear that the process faces some serious challenges in regeneration. Amniotic fluid, the protective liquid surrounding an unborn baby, is discarded as medical waste during caesarean section deliveries. However, there is increasing evidence that this fluid is a source of valuable biological material, including stem cells with the potential for use in cell therapy and regenerative medicine. A team of scientists and clinicians has now developed a multi-step method, including a unique collection device and new cell harvesting and processing techniques, that enables term amniotic fluid to be safely harvested for large quantities of cells. After receiving a stem cell injection into his spine, Kris Boesen, who was paralyzed from his neck to his toes after a car accident, is regaining movement in his extremities and hope for increased independence. The pioneering surgery is the latest example of how the emerging fields of neuro-restoration and regenerative medicine may have the potential to improve the lives of thousands of patients who have suffered a severe spinal cord injury. New diaphragm tissue in rats has been successfully created in the lab using a mixture of stem cells and a 3D scaffold. When transplanted, it has regrown with the same complex mechanical properties of diaphragm muscle. The study offers hope of a cure for a common birth defect and possible future heart muscle repairs. A little more than a decade ago, researchers discovered that all cells secrete tiny communications modules jammed with an entire work crew of messages for other cells. Today, a team of researchers is harnessing the communications vesicles excreted by stem cells and using them to induce the damaged heart to repair itself.